My daughter often says, "my job is done", when Phoebe demonstrates that she has learned something really important to our family life! Usually that pertains more to her interest in music or movies from the past ... or her interest in technology! On Thanksgiving, I thought "my job is done", when Phoebe came in the front door carrying a box and proclaimed that nobody was to go into the dining room until she was finished! 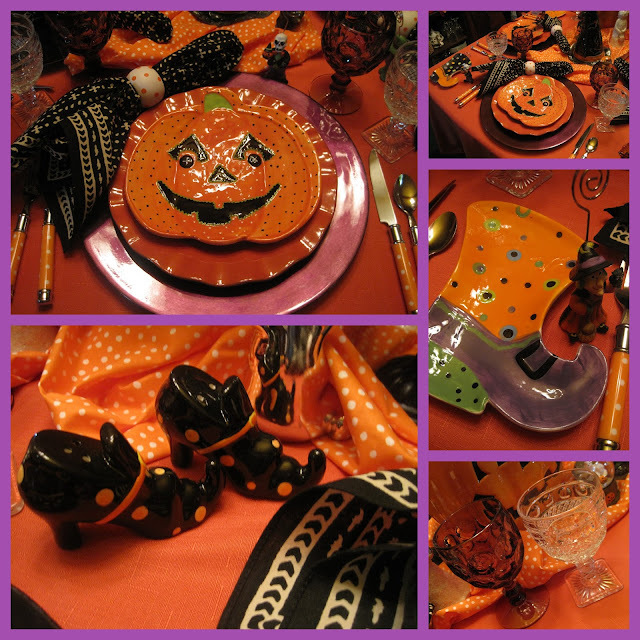 She had some decor to add to the table. Take a look! Don't assume that Phoebe had her holidays confused! Her mama had been teaching her about the long history of Thanksgiving Day and the fact that George Washington had proclaimed the holiday in 1789. We've also been having lots of conversations lately about the importance of our flag and the National Anthem and how all these things represent the freedom we have in the USA. So ... it was important for Phoebe to include flags on our tablescape ... and the quill pen is just like the pilgrims used. 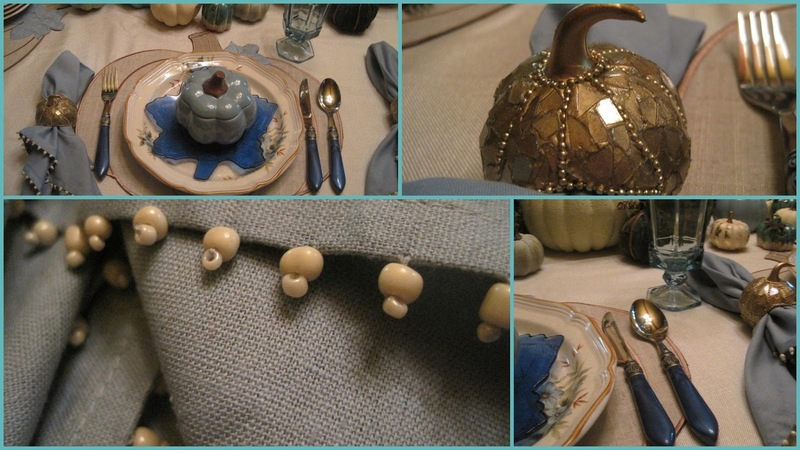 Our Thanksgiving tablescape included turkeys ... one wearing teal pearls around her neck! 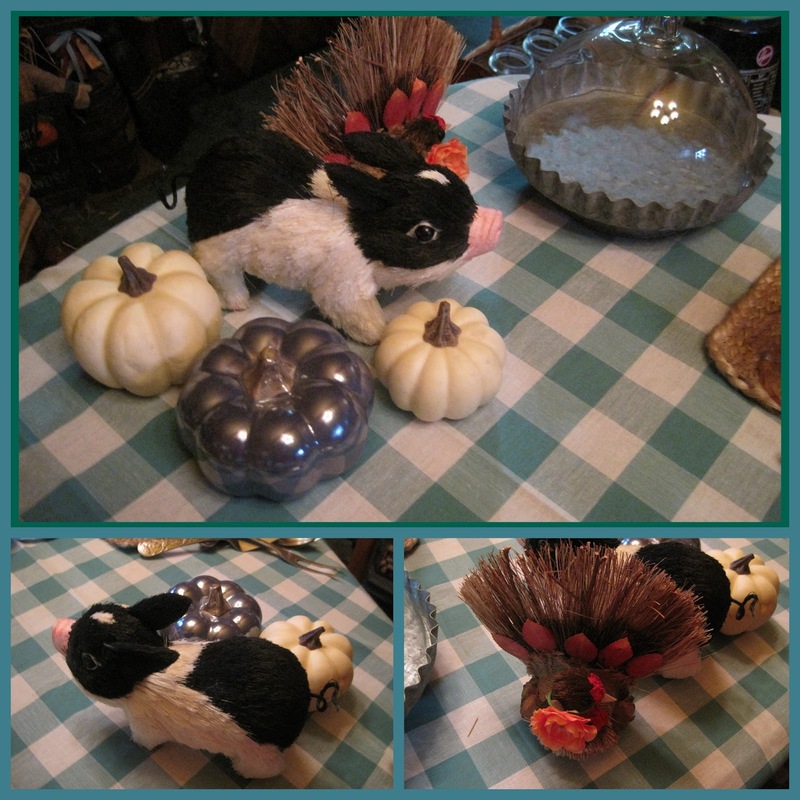 I have been collecting cornucopia baskets for years and these little tiny ones are part of my collection! This year I placed them on Pioneer Woman coasters and filled them with candy. There is almost always a pig on my tablescape! Thanksgiving is no exception! You might recognize this checked table cloth as a Pioneer Woman piece. I left all my turkey dinnerware on the shelves this year and used the new PW Willow pattern for Thanksgiving. 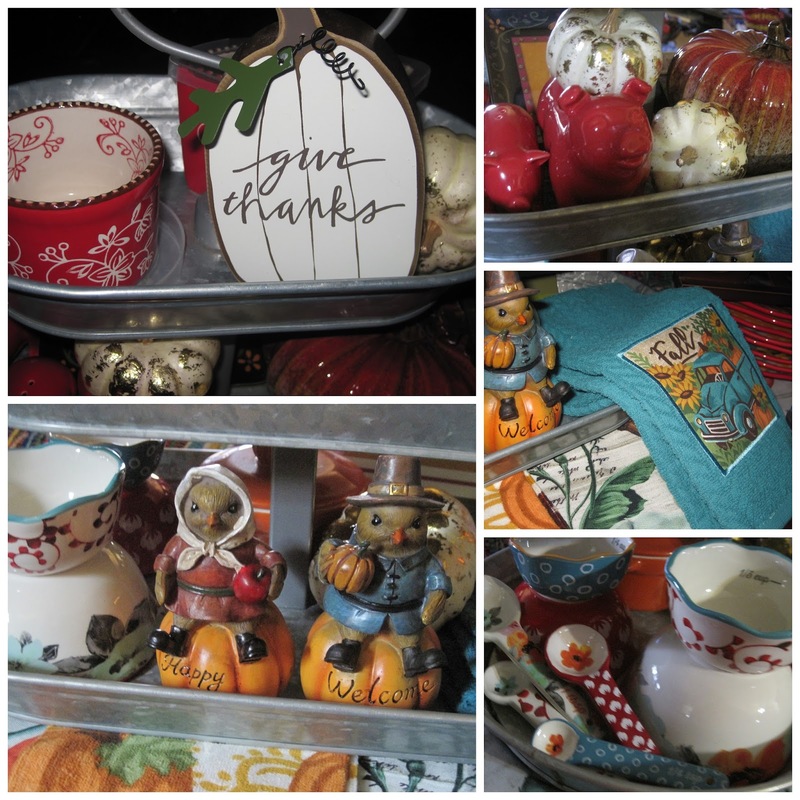 I'm trying not to buy everything I see made by PW, but when I saw the large platter, I bought it. 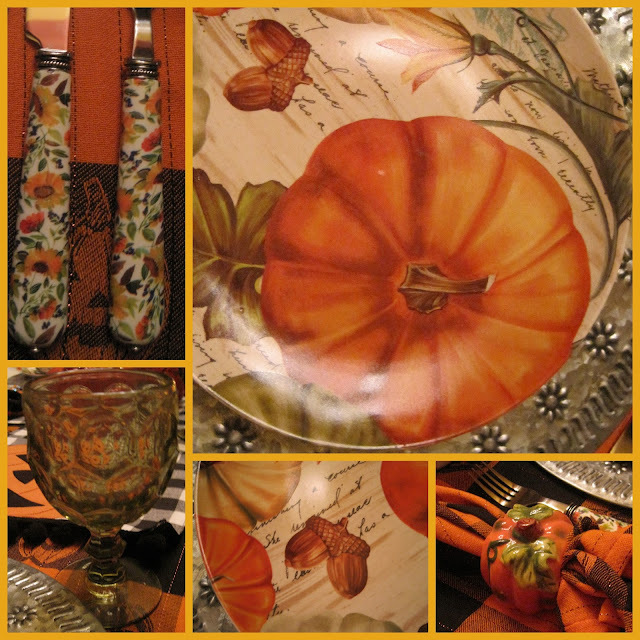 When I realized what a nice turkey platter it would make, I bought the dinner plates and gigantic mugs! I decided to add some flowers to my turkey shaped napkin rings, so they would look cute with the Willow pattern! 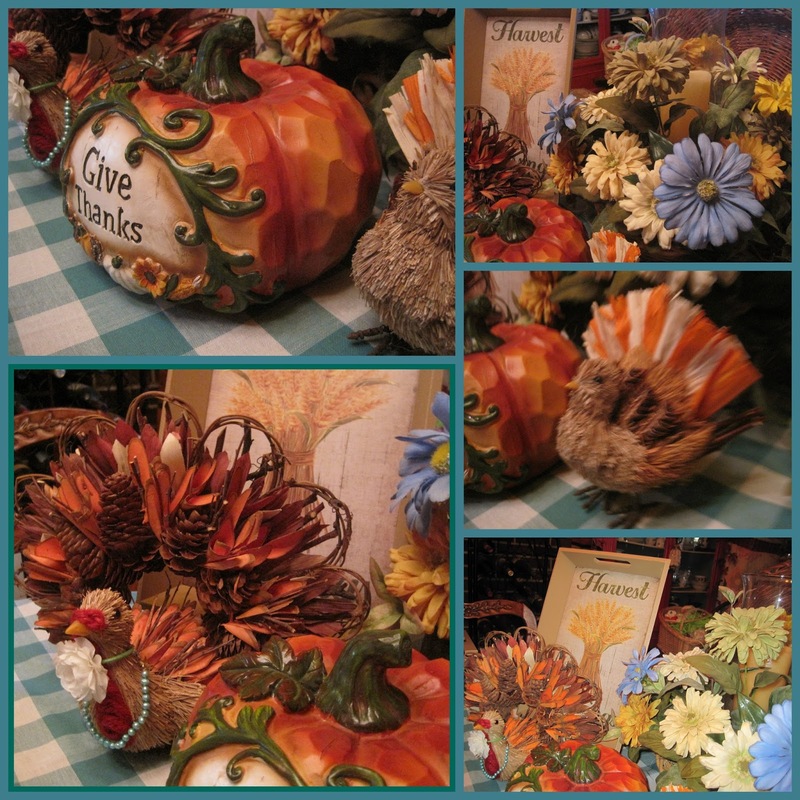 The pearls on the turkey in the centerpiece, set the overall theme! 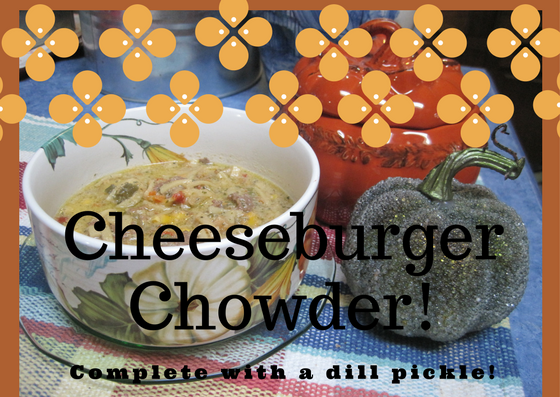 I made a small batch of Cheeseburger Chowder over the weekend! I needed to stock up on a few frozen containers of soup to use for my lunches. I thaw them in the fridge over night and I package just the right amount for my mini crockpot that I keep in my office. The ingredients are simple and you can use whatever you have on hand. The one thing that I add ... that I've never seen in any other recipe is DILL leaf! That adds the subtle flavor of a dill pickle and that makes it taste truly like a cheeseburger! Brown half a pound of good ground beef. Leave some big chunks. While the burger is browning, add 1/2 cup chopped onion and half a cup of chopped red and/or green bell pepper. 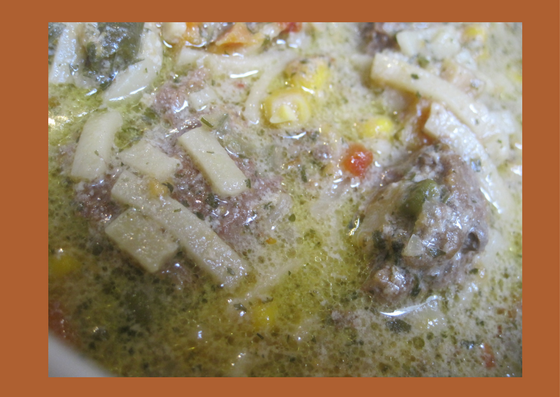 Add 3 cups of beef broth, a half cup of uncooked pasta (I used noodles) and a cup of frozen corn kernels. Let the soup simmer about 30 minutes. Finish the soup by adding 1 teaspoon dill weed, plenty of freshly ground black pepper, 1 cup of sour cream and 3 cups of shredded cheese. Continue to simmer the soup for another five minutes, stirring constantly so all the cheese melts and the sour cream blends in nicely. 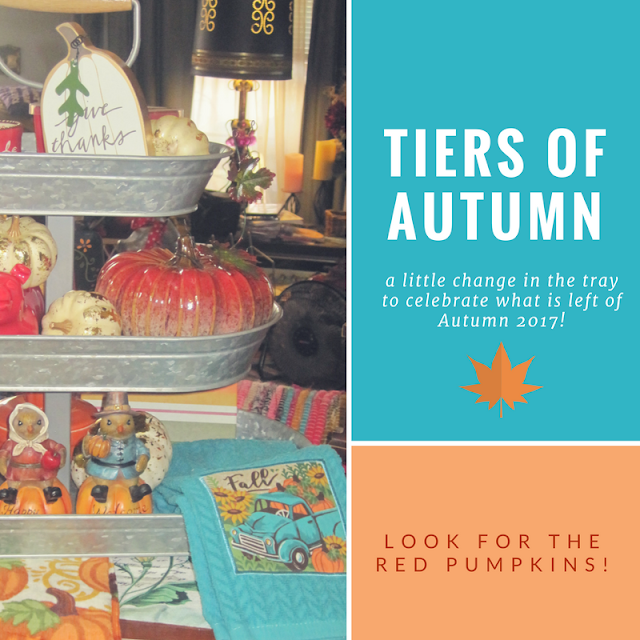 I decided to load my galvanized metal tiered tray with some autumn decor. It had been sitting on the sunroom table, filled with an apple theme! When you have red furniture, you have to have some red pumpkins! Don't you love this teal pickup truck! The tray is filled with pumpkins, pigs ... and nothing I do lately seems to be void of a piece from the Pioneer Woman! Measuring bowls and spoons are tucked in the bottom shelf! I don't use them ... because they are just too cute! I happened in to the local Walmart when Halloween things were 75% off and there were a few glittery pumpkins left, so I bought a couple. 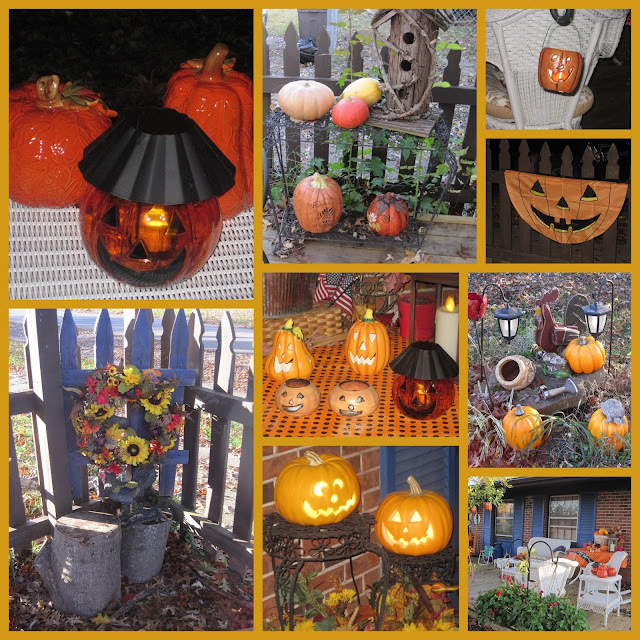 I already had plenty, but I do love pumpkins! 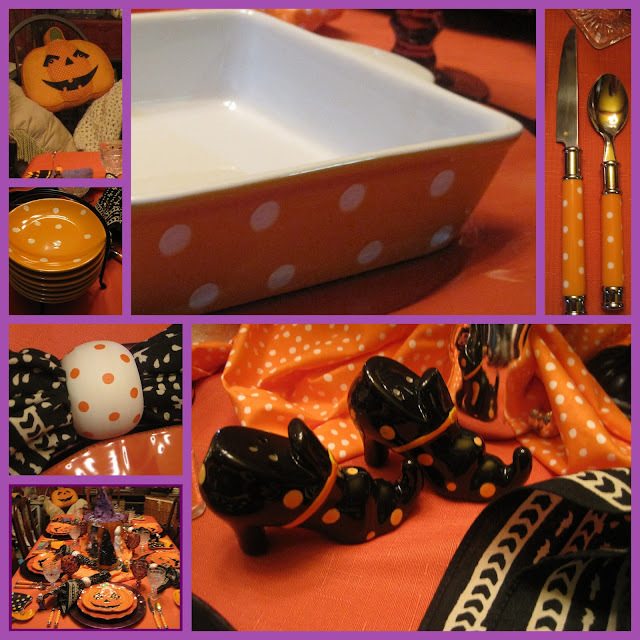 Having my new additions to a rather large collection meant that I had to set one more pumpkin tablescape. No, it won't really be the last one for the season ... I have another one planned for later! 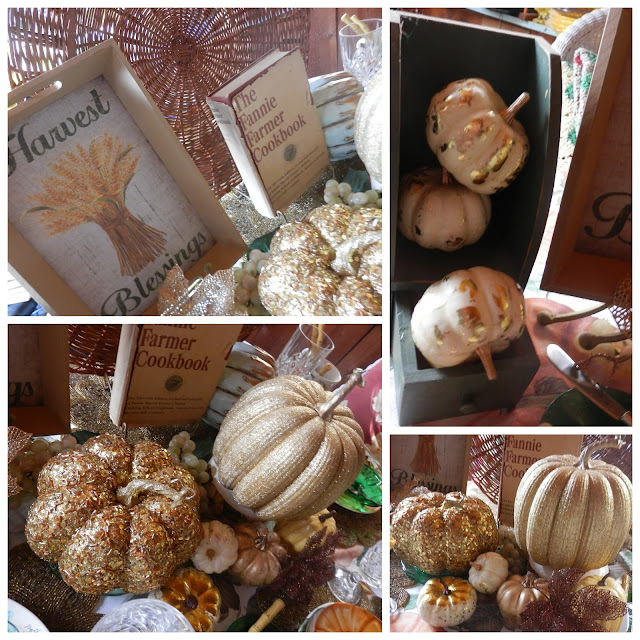 I also found this cute Harvest Blessings framed tray, so it became an important part of my composed centerpiece. Notice my 1965 edition of Fannie Farmer's cookbook! That was the 11th edition published of the original 1896 cookbook. 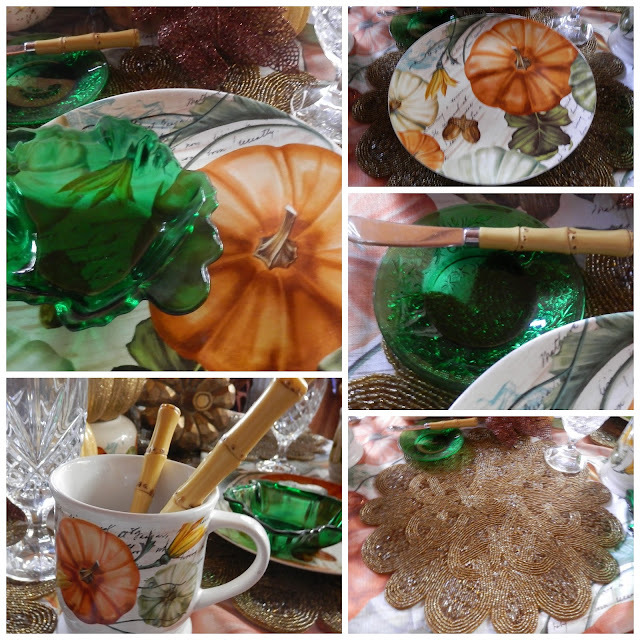 I mixed my very affordable Walmart Mainstays pumpkin dinnerware with a little collectible green glass! 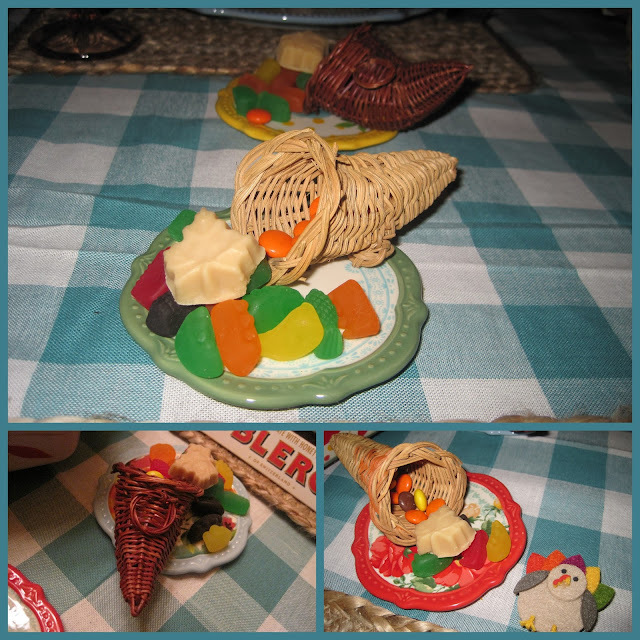 The tiny butter plates are what we got in the oatmeal box when I was little ... Sandwich Glass! 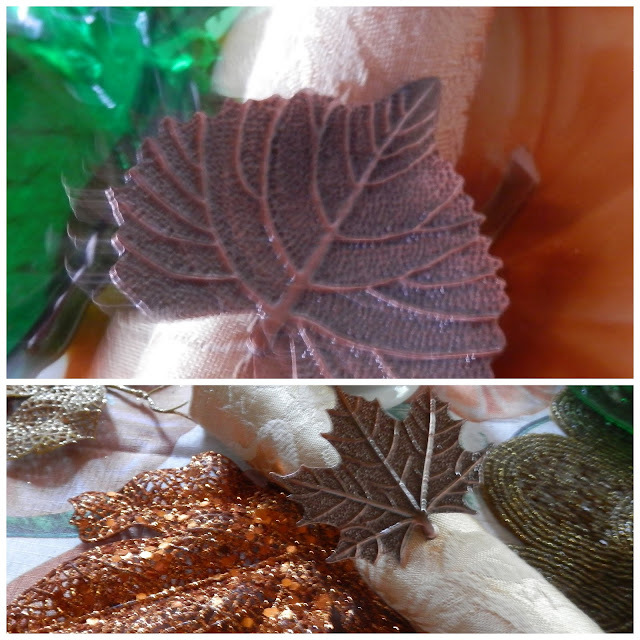 The green leaf shaped bowl is Anchor Hocking 1960s vintage ... probably from a dime store! 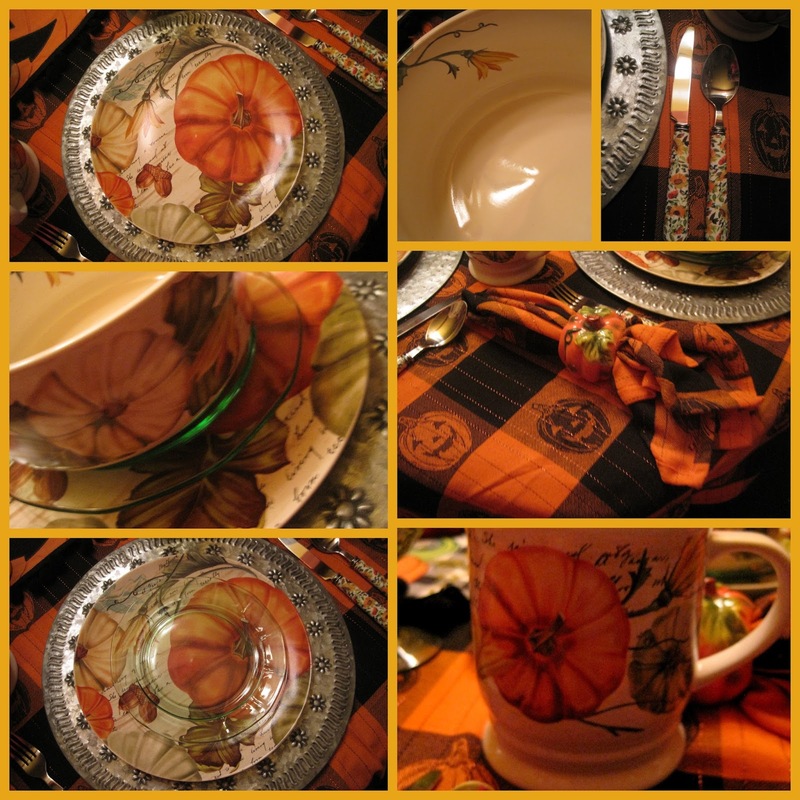 The faux bamboo flatware is twenty years old and just part of my stash! The beaded place mat is from Kohl's ... on sale-on sale after Christmas a couple years ago! I would never pay the original price for those things! Miss Phoebe is spending the night with me tonight, so I think we'll eat Sunday brunch on this table in the sunroom! When she was little bitty, I'd let her drink coffee from a demitasse cup! Now, we have our coffee from a big mug. I've ruined her. 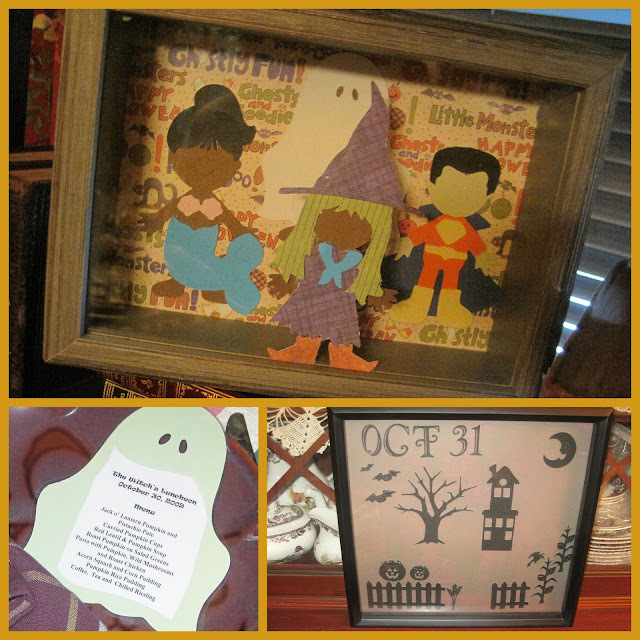 I'll share this post with some of the parties listed in my sidebar, so make sure you click through to see the other posts! Hope you are enjoying the autumn season! This creamy comfort food is perfect for Saturday night supper on a cold evening! Who doesn't love to smell something wonderful from the oven? Who doesn't enjoy relaxing for 45 minutes when the oven is doing all the work? 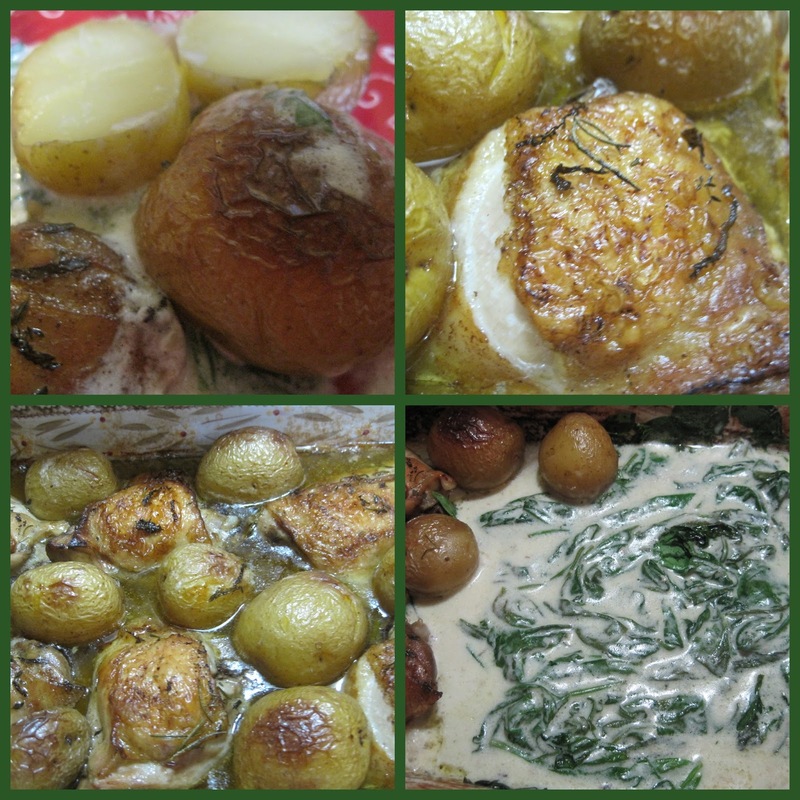 Just look at these glistening potatoes and the glossy skin on the chicken thighs! I used chicken thighs because I love the tender meat on the thigh. You could use chicken breasts, just plan on cooking it a little longer. You could also use skinless, boneless breasts ... and you'd roast those in a little less time! Place 6 to 8 chicken thighs in a 13x9 baking dish. Surround them with tiny potatoes. Pour 1/2 stick of melted butter over the chicken and the potatoes. Add 1 1/2 cups of chicken broth to the dish, but don't pour it over the meat and vegetables. That will cause the butter to run off and into the dish. Pour your broth carefully at the edge of the dish. Add your favorite fresh herbs and a little minced garlic over the top of the chicken. Roast (uncovered) for 45 to 60 minutes at 350 degrees. Most of the broth will be absorbed, but during the last 5 minutes of roasting, pile all the meat and vegetables on top of each other and make room to add a bag of fresh baby spinach. Before you add the spinach, add a tablespoon of flower to the remaining broth and whisk it around. Add the spinach and it will wilt beautifully in the oven. 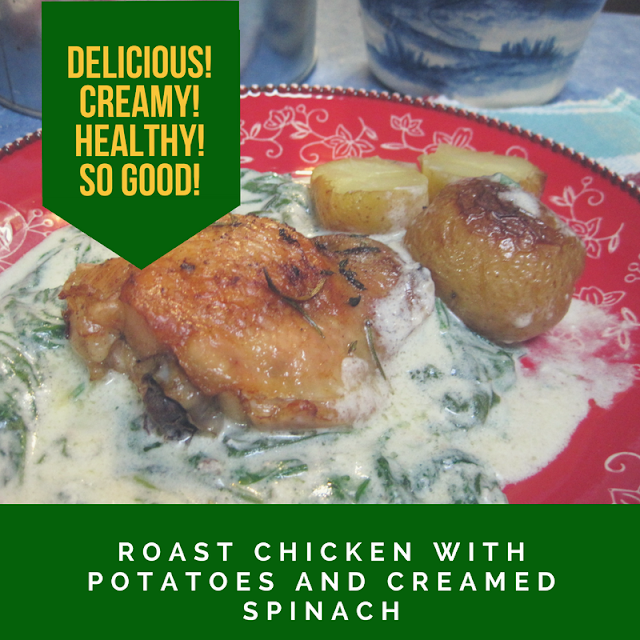 Remove the baking dish from the oven and add half a cup of Half and Half to the spinach side of the dish! Toss the spinach around in the Half and Half. The flour slurry you made will cause the Half and Half to thicken a little. The end result is beautiful and delicious! 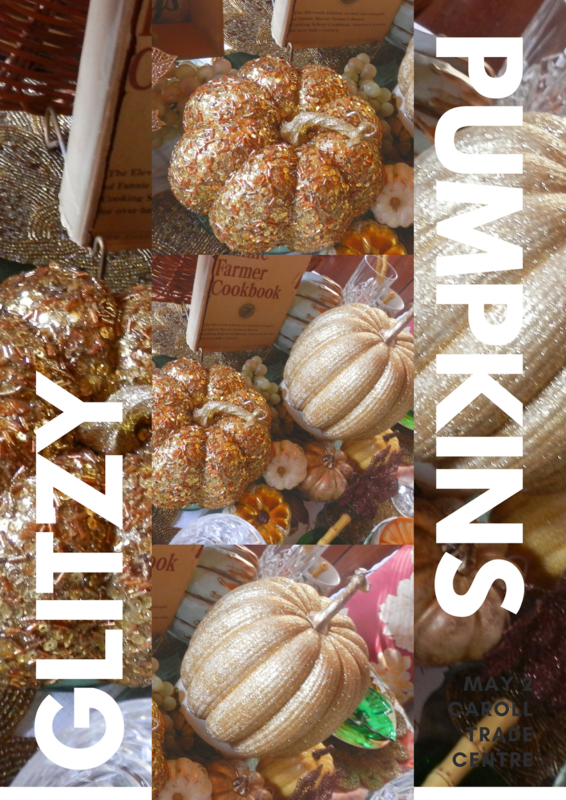 I may share this post with some of the blog parties listed in my sidebar, so make sure you click through to see the other posts! 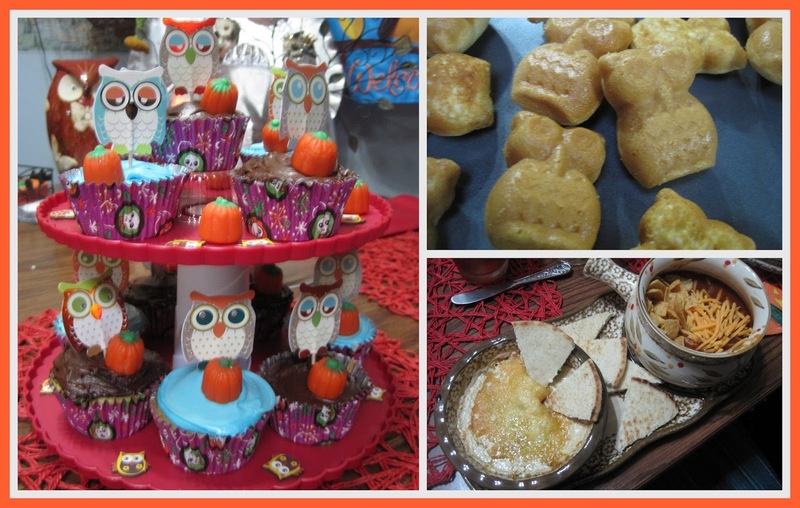 Our Halloween celebrations always include a chili supper! 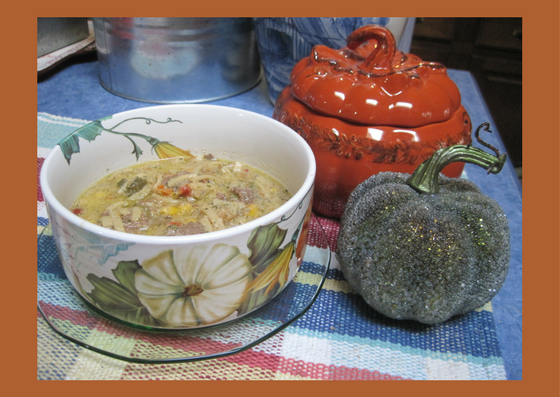 This year, I made the usual venison chili using Papa Joe's acclaimed recipe ... but I also made white chicken chili, for the first time. It might become 'acclaimed' too! 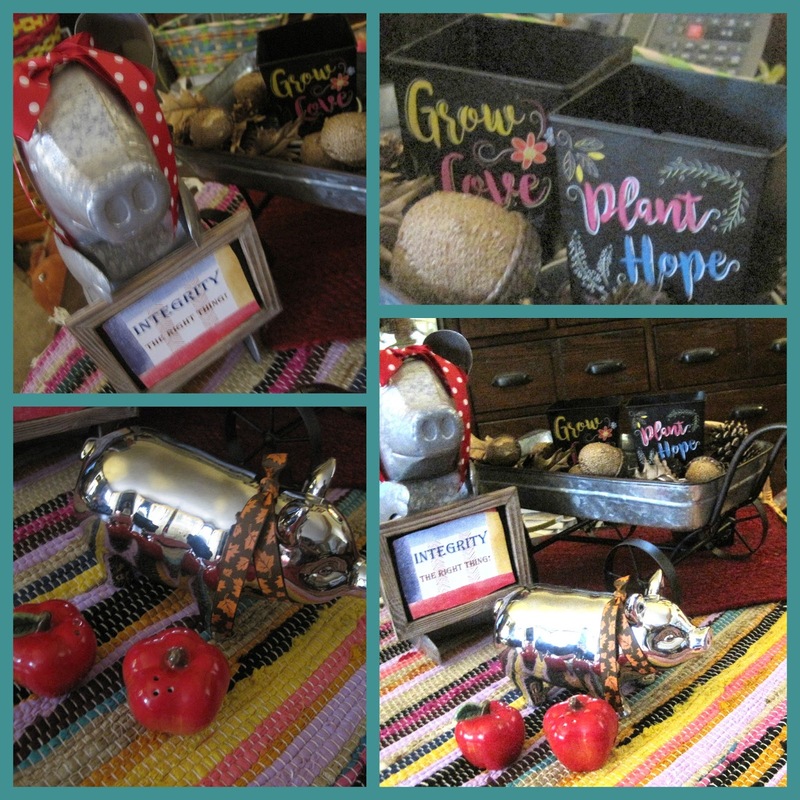 If I don't stop buying galvanized metal ... my whole house will be filled with it! I love that look and I think it just comforts my spirit ... kind of like comfort food ... it takes me back to the earliest days of my marriage, when Joe would ice down watermelons spiked with booze in a big galvanized wash tub that had been his grandmother's! She would have spun in her grave had she known we were intoxicating water melons! 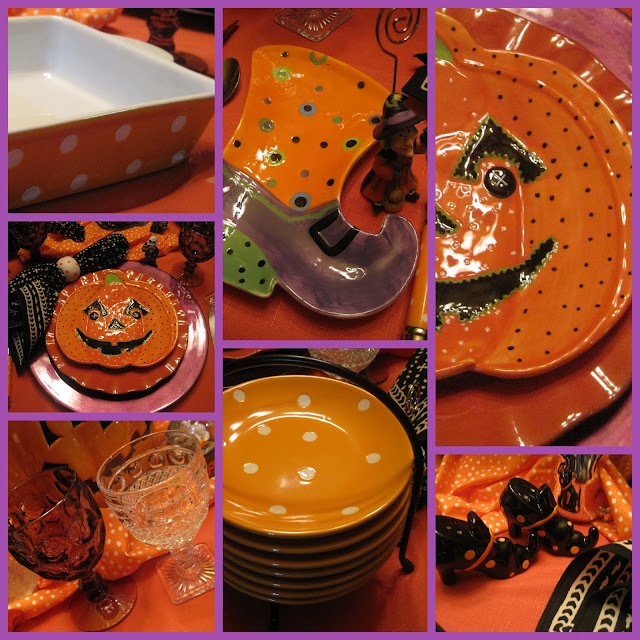 Did I need to buy these pumpkin dishes from Walmart's collection this year? The answer is NO, NO, NO. 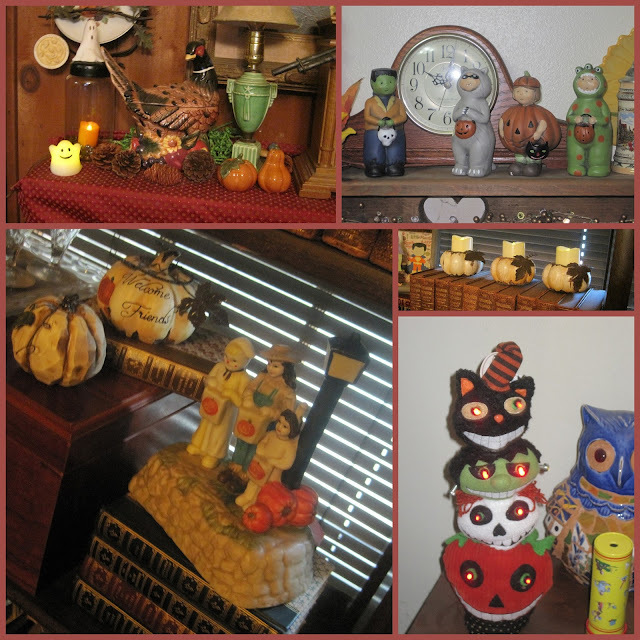 If you don't believe me, check out my Halloweens of the Past post RIGHT HERE! 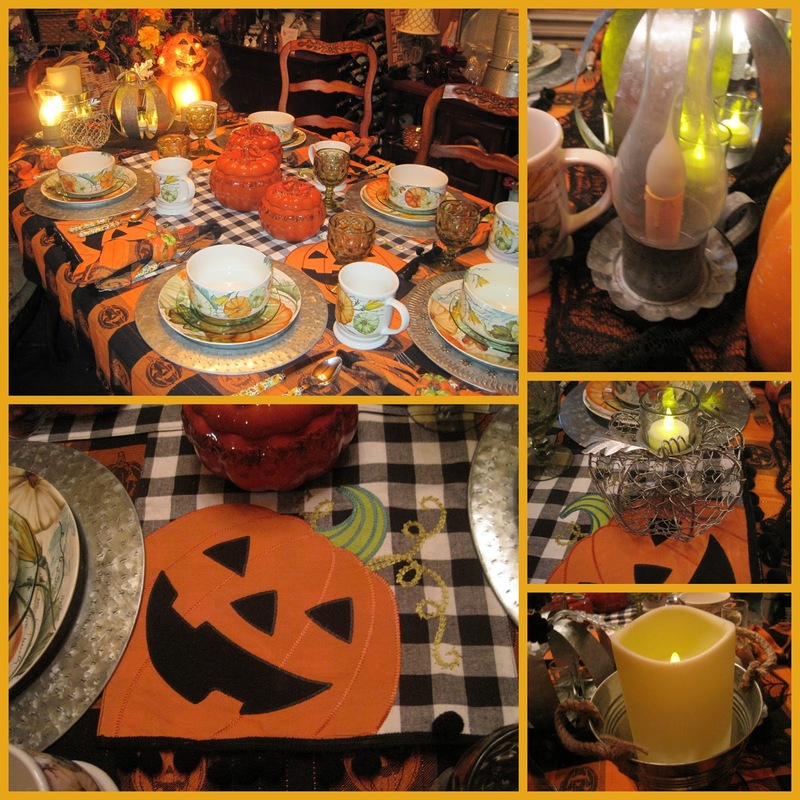 The galvanized chargers came from Miss Phoebe as a Mother's Day gift; the flatware is Mikasa ... sunflowers; the stemmed glasses are from my vast vintage collection; and the cute pumpkin napkin ring is at least ten years old, but I remember buying them at JoAnn Fabric! 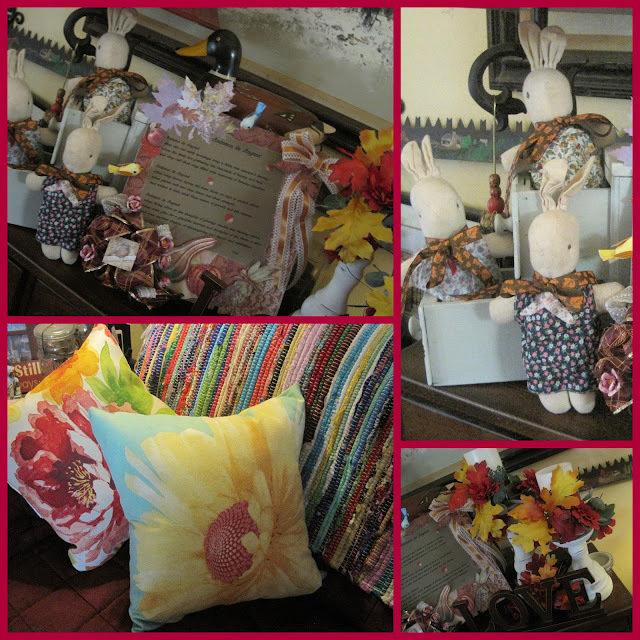 Miss Phoebe and I always enjoy shopping our favorite collectible shop before holidays. This year, we found this tablecloth and napkins (a Kohl's product) and they had never been used ... so they came home with us! 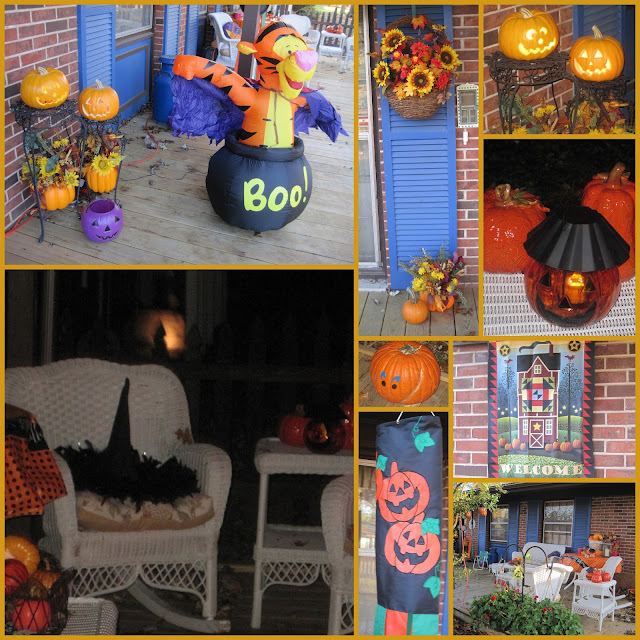 Just thought I'd post some pictures from Halloween parties in the past! 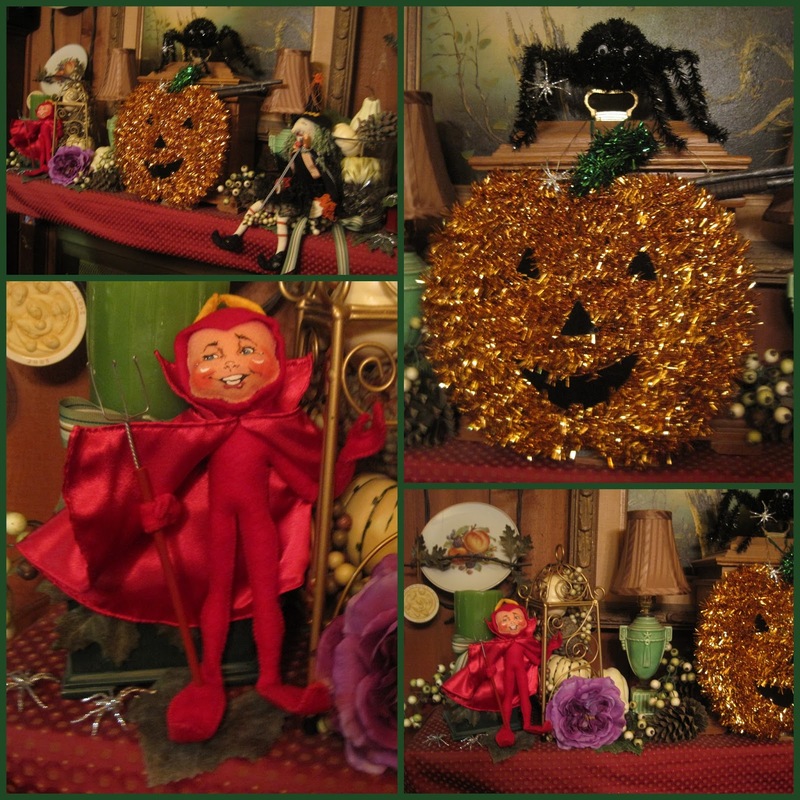 Halloween is a favorite family holiday at our house ... and it centers around taking care of the little goblins that visit for treats ... and eating chili! Enjoy! 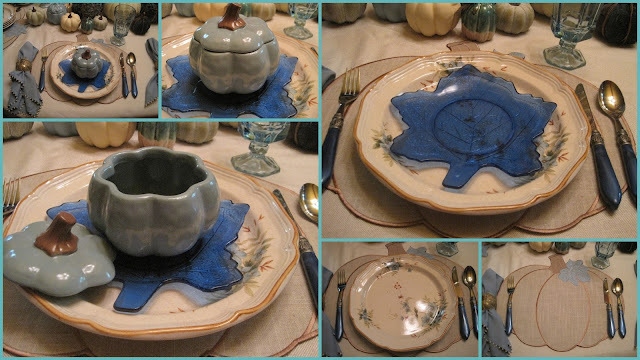 This is not the first birthday dinner for my daughter ... that we have celebrated with blue pumpkins! 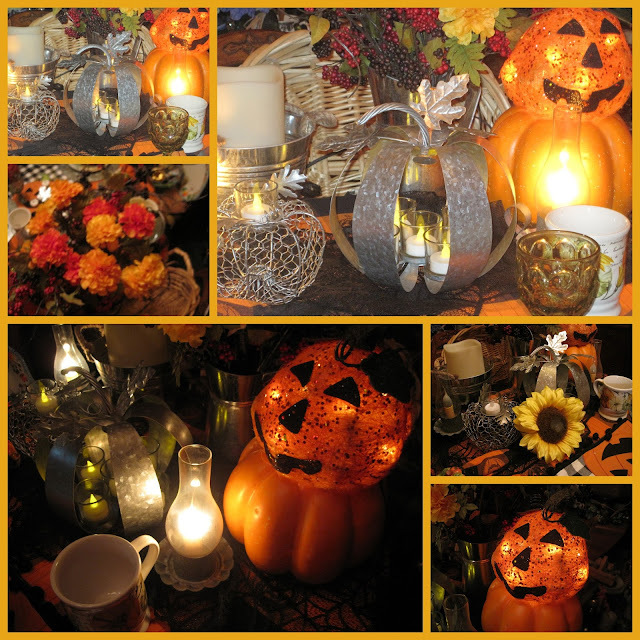 It is, however, the first time the tablescape include all these old canning jars! The big jar is a new acquisition from Big Lots! 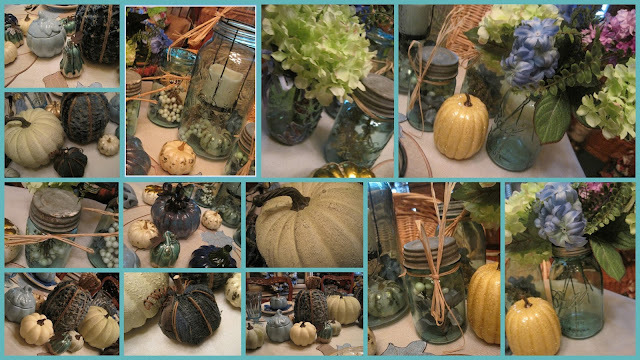 Just look at all the blue pumpkins ... ceramic, plastic faux, blown glass ... fabric and one made with corn shucks! 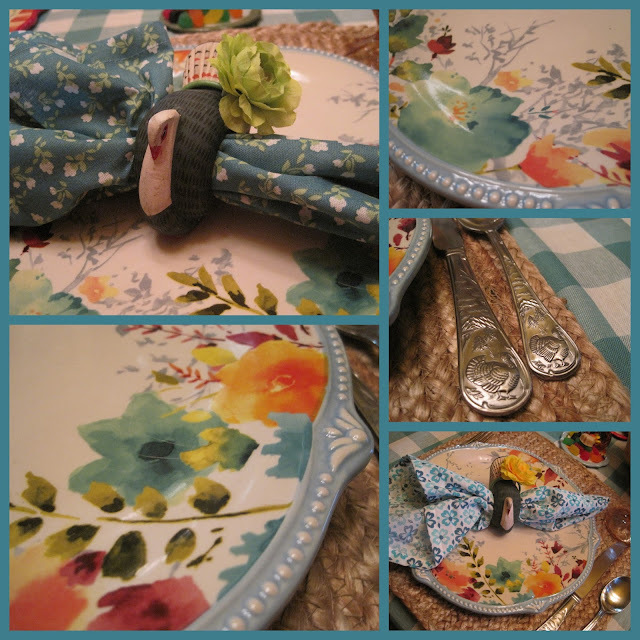 These cute napkins and napkin rings came from Pier 1 ... the soup bowls have been in the cabinet for a couple years ... and the blue maple leaf depression glass plates are some of my favorites! The dinnerware is 1970s Mikasa and the flatware is Cambridge. Blue !!!! I'm afraid that something at Big Lots caught my eye a few weeks ago. A pretty teal pumpkin! Then I saw another one ... then I saw some blue pumpkin shaped candles and all that reminded me of the year that I decorated my sun room for Halloween in BLUE! Phoebe was little then, and she loved the word BLUUUUUUE! She would drag in out and emphasize it and make us all mimic her! 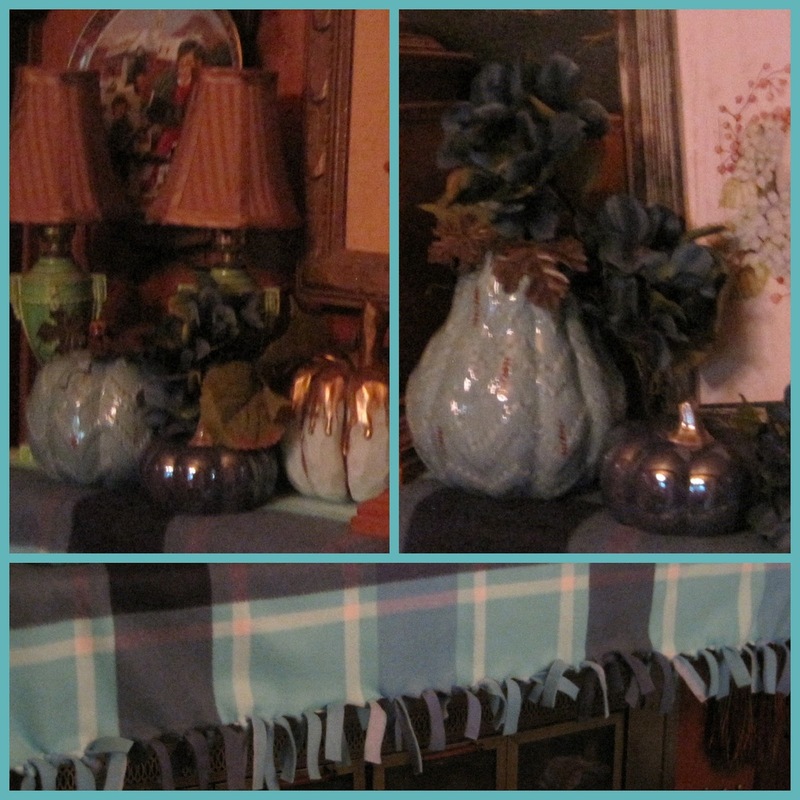 So, I decided to have a blue dining room for autumn, until the Halloween decorations came out! 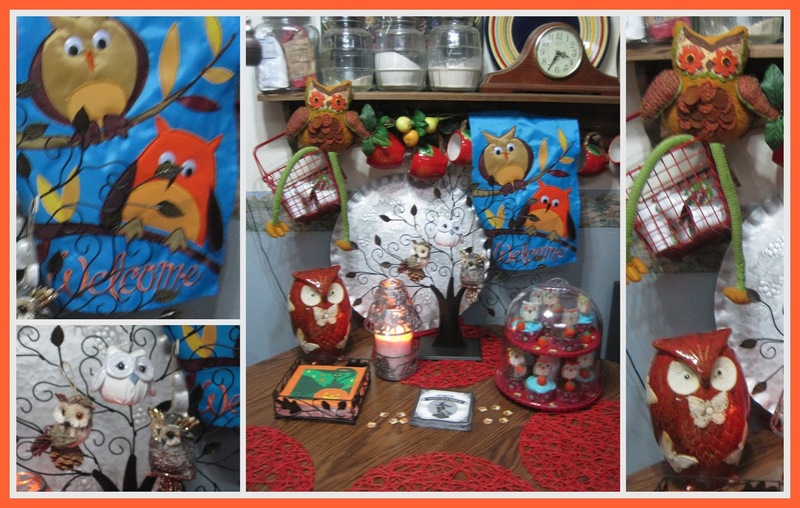 My picture came from Kirkland's .. and don't you love that cozy blanket hanging off the mantel? It took about ten minutes to make that!